This entry was posted in My realisations, My spiritual Journey and tagged anarthas, Bhaktivinoda Thakura, crying to Krishna, Crying to Radharani, Gopinath, how to cry to Lord, mercy, progress in Krishna consciousness, Radharani, spiritual journey, why to cry to the Lord.. Bookmark the permalink. Hare Krishna Prabhuji, Dandavat Pranam. Pls accept my humble obeisances. I must say what a heartful blog that can wrench anybody’s heart. However like you said: “If you are living in someone’s house and crying, they are bound to ask you what is wrong.” Is there something that is troubling you ’cause everything seems perfect….but then u know better and what better place than Vrindavan….I must say you are such a wonderful soul…to even realize there is something wrong….Pls help me also as I have so many impurities but need critics to point it out…pls pls help me.. I was feeling very low, rather helpless, in front of various material situations which I face. What were earlier normal situations are now bewildering for me. I just felt like going out in the open and keep my face towards the sky, raise my arms and cry aloud for the Lord. I realised, only a little, how badly I am trapped here. Then, miraculously, after writing and posting the blog, I got a wonderful mailer from the office of HH Gopal Krishna Goswami Maharaj, which put me to ease. It was like a personal instruction from Maharaj for me. The timing and the topic of his mail was too much to be a mere coincidence. I am blessed to have a caring and affectionate friend like you. All glories to Guru Maharaj. An inner call to visit dhama right before I leave for an important trip next month is in right order to pray for my consciousness to remain clean. Thank you so very much for you post and realizations prabhu. I was just wondering how impure I am inside. Knowing that we are soul and we cant enjoy independently still all sort of worldly desires were sprouting since morning and it was becoming very difficult to control it. But Krishna is so mercy full he just sent a devotee to give me association and then I just read your post. 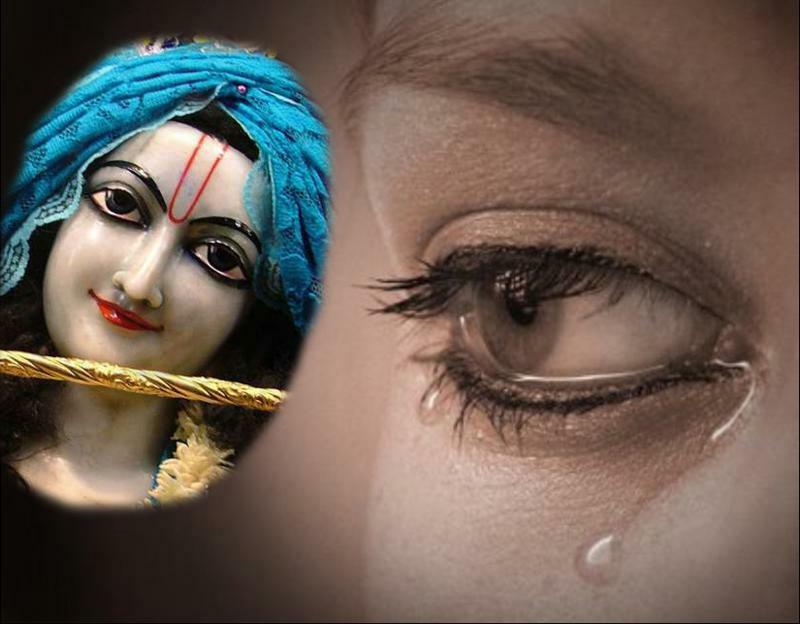 I am feeling good but I am spiritually so hollow that still I am not feeling gratitude for Krishna deep from my heart. Please pray for me that I also some day develop a desire to cry out loudly for the lord and experience practically that this world is just a place of sufferings. Thank you very much for your kind words and sharing your inner thoughts with us. We are all in the same boat, someone is sitting in the front of the boat and someone else is sitting in the rear end of the boat but the boat is same and hence we all face same situations. Sometimes I think that we receive such material miseries or realisations as a special mercy to ensure that we get internally convinced that this material world is only a place of misery and nothing else. Many a times I fall into illusion that now I have joined the process of bhakti yoga and if only I can make some adjustments and then the life will be great in the material world as well. This may be true for acharayas and senior devotees but not true for me at my current level. We all need to read scriptures, including Srila Prabhupada’s books, regularly to develop a distaste for this material world and gratitude for Krishna. A true feelings from a true devotee…………….. This is unebelivable! This is exactly what I felt this morning, entirely hopeless and I searched the net to read topics which are similar to my feelings, but nothing intereseted me, I got up and read “Saisatcharitra”, felt very light and after then I checked my mails and lo I found this mail. I am weeping!! melted with Lord’s glory that he made me read what I wanted to. Very truly said surrender to the Almighty and you will experience eternal bliss which cannot be compared or measured to any wordly delights. Blessed are the ones who enjoy this bliss, let the merciful Lord grant this bliss to one and all and this world will be a wonderful palce to live in. Thank you for your mail and I feel blessed that this blog written by a shudra like me could give some solace to your agitated mind. The very purpose of writing this blog is to share our realisations among devotees and feel inspired from each other in our spiritual journey. Lord has indeed granted His bliss to everyone, we can all chant the Mahamantra and feel this bliss. Lord also mercifully sends Vaishanavas Acharayas in this material world to show all of us the way back to Godhead. The problem lies within me as I rely on my own material intelligence and do not surrender to the Lord or His representatives. All glories to Srila Prabhupada. All glories to Guru and Gauranga. Thank you very much for this kind article for a fallen soul like me. Really, this article has showed my real face to me. I have so much pride and ego internally. But externally I showed myself as very humble devotee. It is exactly like a tiger under cow skin. I am very much interested to cry out loudly for the lord in helpless. Kindly give your association to me. So that I can also start to relish the pure and real Krishna Consciousness. Once again, thank you very much for such a wonderful article. This is such a coincidence I was just looking at the Krishna’s picture and started crying and felt that I just cry for name sake looking at Krishna and then next minute I am again into the worldly desires and soon I was just scrolling down and I saw this post. I just felt that it is written for me. 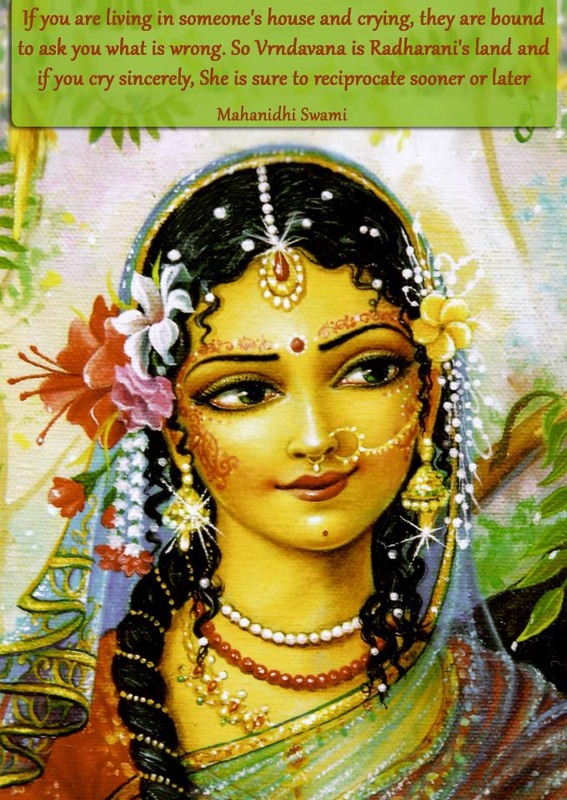 I exactly feel how it is written by HH Mahanidhi Maharaj. I felt so good and could not stop crying reading the quotes.